This is a quick blog to let you all know, that we are fine and that our trailer is still standing with some minor damage. Saturday 23rd of July 2011, a wicket wind storm gathered and hit our campground in Val-Comeau on the north coast of New Brunswick. We were down to Miramichi and did the tourist thing as well as picking up some supplies. We saw the clouds coming in very quickly on the horizon. We are down to 50 km/hr on the highway. We hurried back towards our campground. 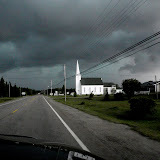 The wind and rain got so bad we were down to 50 km / hr on the highway. Trees were rooted up, thrown across the road. Sure glad we had that heavy diesel motor holding the truck down, that was all I could do to keep it on the road. Just before we got back to camp the fire trucks past us. At camp, trailers had been thrown around, some with people in them. We talked to the people next door. Their son was in the washroom when their trailer flipped over. One other trailer had apparently four people in it. As far as we know 7 trailers flipped over, but as far as we know no one was hurt, just shaken up. Our trailer has the awning ripped off, the toppers on the slides are partly ripped, and there is some cuts into the body of the trailer where the awning hit. Our trailer skidded two feet side-ways.... The wind must have lifted the trailer right up on two wheels at one time, the outdoor carpet was right under the other set of wheels. All our leveling blocks (pink and yellow) was blown all over the place. Found one of my missing flip-flops and a leveling block this morning. We dismantled the rest of the awning so it would not do any more damage to the trailer. There must have been some water blowing in somehow, we had some water on the floor inside? Not sure where it came from. The front landing gear or jack was sitting on the pink leveling block.... that's how far the trailer skidded sideways. The second landing gear skidded and dug into the ground about 6 inches. From what we can tell now, the only major thing damaged is our awning. However, we are still assessing the situation. We will drive up to Tracadie-Sheila and Caraquet today. There is supposed to be a few RV dealers up there. Cuts into the side of the trailer. Looking from the roof down - damage to trim. We called ICBC and filed our report. We were told that an out of province adjuster will contact us in a few day. We'll keep you posted. I'm sure it will all work out fine. View from our roof. Power is now being restored. From what we have heard, there was four people in this trailer. Lucky no one was hurt. Apparently some other areas were hit really badly, with roofs of houses blown off etc. Over all we were very lucky. Finish the day of with some chicken on the BBQ and a "stiff" drink. You would have never known there was a storm a few hours ago. We will stay here for two more nights, and then head north in direction, Quebec. For more pictures of this mess, see our Picasa Web Album. PS. Do we still enjoy camping? Absolutely, Yes. We are having a grand time. Liz is doing laundry to steady her nerves. Wow! A sigh of relief! Nobody hurt and everything is repairable. Kudos to both of you! good karma you 2 ! So glad to see it didn't damage your home-on-wheels any more than the awning. Will you be taking on extra ballast in case of future turbulence ? Wow that is scary. Our little Tab would have been airborne. Hope we don't encounter any of that wind when we are there in about a month. Glad to hear your damage wasn't too extensive.